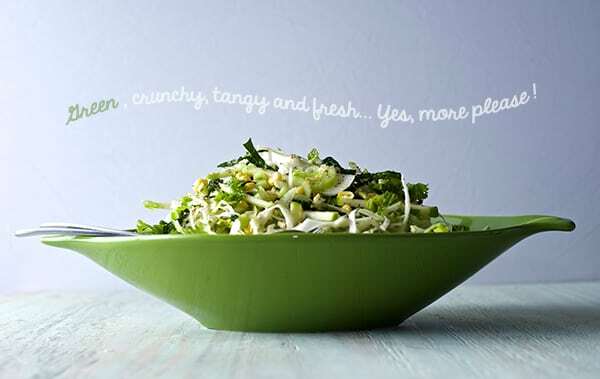 Green Green Coleslaw ~ Yes, more please! Texas summer heat is like Kryptonite. Do you remember how Superman used to get exposed to this green glowing Kryptonite and you could hear a sound like this: ~ waaayioh, waaayioh, waaayiho )) ) ) ) ) you could almost see the waves that debilitated the strongest blue and red caped man in the comic world… Well, I’m not muscled or caped like Superman, but the Summer sun is my Kryptonite. No, the truth is that I’m in much need of a little break from the high temperatures. I needed a boost of fresh glowing green in my life and I could not resist some leafy crunchy vegetable medley action. We all know what this leafy greens are brimming with fiber along with vitamins, minerals, and plant-based substances. Imagine what they can do for you. August is a hard month to get great produce; too much heat here in Texas. 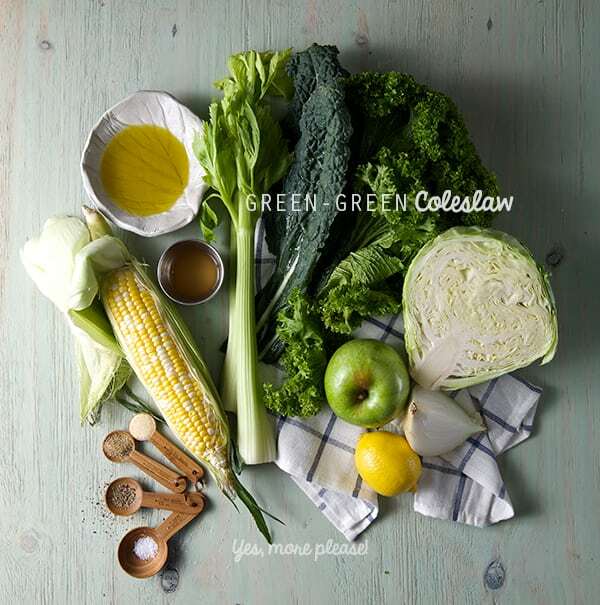 I know the green leafy season is not here yet, but thanks to California’s amazing weather and hard-working farmers, I armed myself with some of my favorite green vegetables: kale, mustard greens, green cabbage, green apples, celery, onions and a little fresh corn. After a little chopp-ah-rooh, and combining all this shredded goodness with some light vinaigrette, this Green Green Coleslaw was born. The combination of the different greens add great flavor and texture. 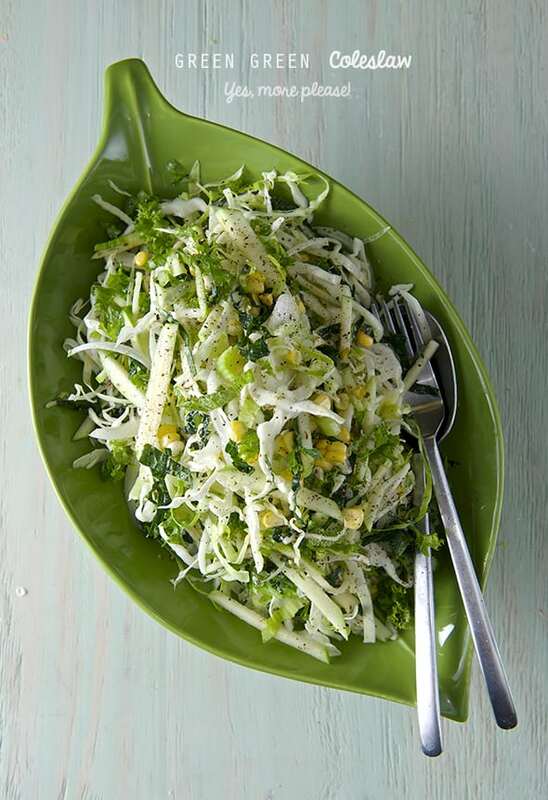 A tangy oil honey and apple vinegar dressing, with a good punch of dry oregano, and seasons, make this green-green coleslaw light and crunchy. It is lightly dressed. No soggy cole slaw for me, thank you. If you are the creamy cole slaw type, this will convert you into the vinaigrette version. 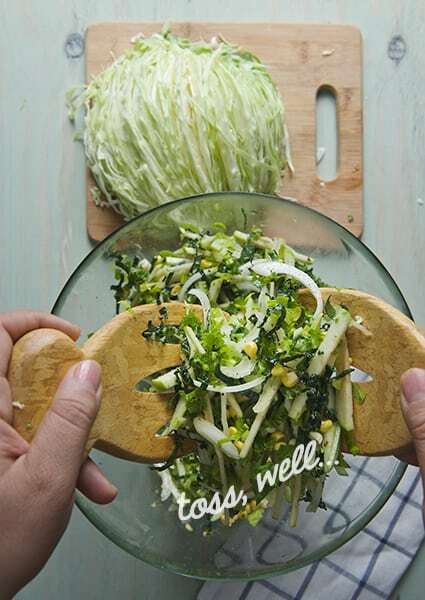 This Green Green Coleslaw, makes a great side dish for, salmon, any white grilled fish, chicken, pork, beef , shrimp, tofu, tempeh, rice, lentils, white beans…you name it. You can add some roasted almonds, walnuts, or sunflower seeds and it will be a great left over for next day lunch. 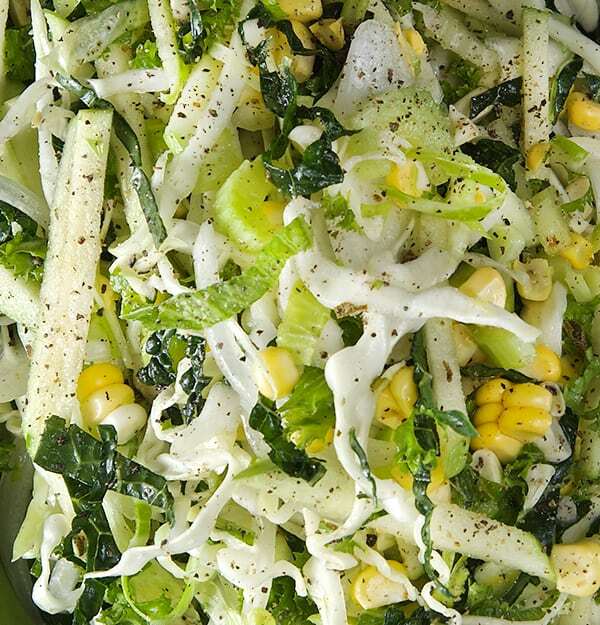 with great personality and flavors, this green-green cole slaw will restore your energy and refresh you on this fiery Summer. Like a good Kryptonite, you know? hehehe Enjoy. Serves 4-6 or 1 super man. 1 large mustard green leaf. The zest and the juice of one lemon. Feel free to add some nuts, for crunch and protein, toasted almonds or walnuts will taste fantastic. Or some golden raisins will add an extra sweet note. If you are a Mayonnaise lover, substitute the oil for 1/2 cup of mayonnaise and 2 tablespoons of plain greek yogurt. 1. 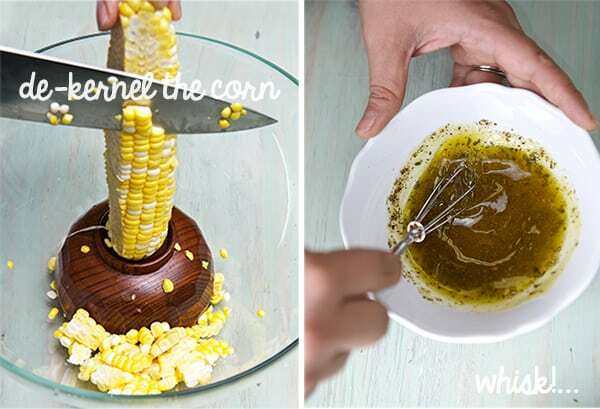 Finely chop the cabbage, the kale (remember to remove the hard steam on the kale and the mustard greens), Finely chop the onions, celery and de-kernel the sweet corn. Chop the apple like matchsticks. 2. 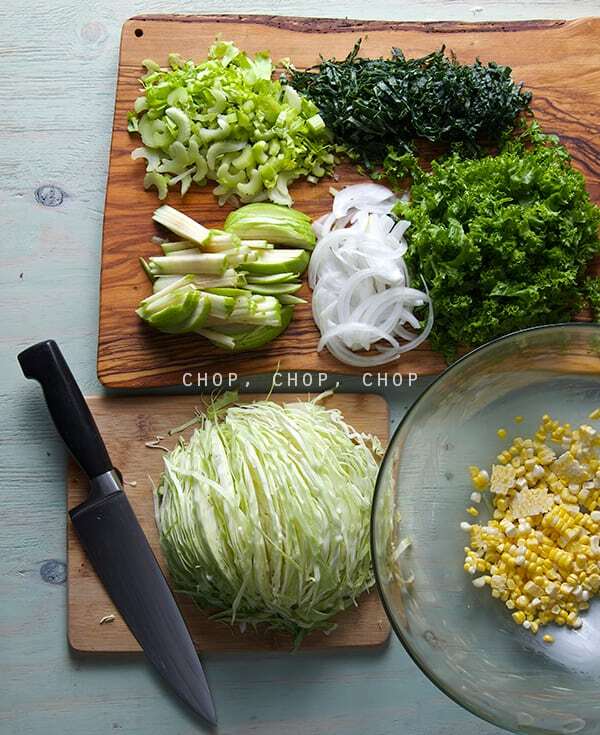 In a large bowl, whisk all your dressing ingredients, add all the chopped vegetables and toss well. 3. Set a side and let it rest for 10 to 15minutes before serving. 4. Taste, adjust for salt and pepper if necessary. Serve and Enjoy!